For book lovers and those who like turning the ordinary into the extraordinary, a bookcase serves multiple purposes: it holds books, yes, but it also displays the homeowner’s personality. A bookcase is never just a bookcase in this article, as we take a look at some of the most unique ones that will be the centerpiece of your next party. With this one, a wall is devoted to hosting many books, with the shelves stretching from the floor to the ceiling. A rolling ladder is also a must, especially for the vertically-challenged who want to peek at what books are on the top shelves. You can make the bookcase any color you want, but a dark stain adds vintage elegance and sophistication. This design is neat because it not only adds pizzazz to a staircase, but very cleverly utilizes space as well. 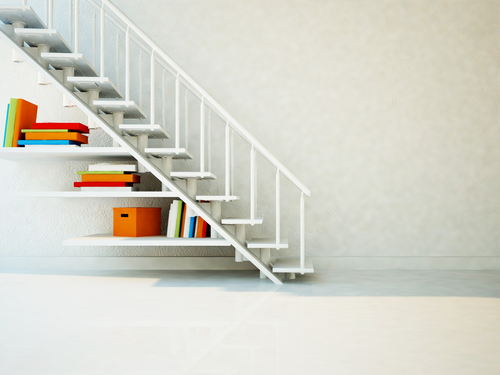 What you want to do is build your staircase out of wood, make sure the steps aren’t closed or attached, and then use the space underneath and behind the steps as shelves for books. And if you’ve got the room, add shelves for more books on the sides of the staircase instead of using it for walls. Gravity says that books are supposed to sit on a shelf, not seemingly float underneath it. 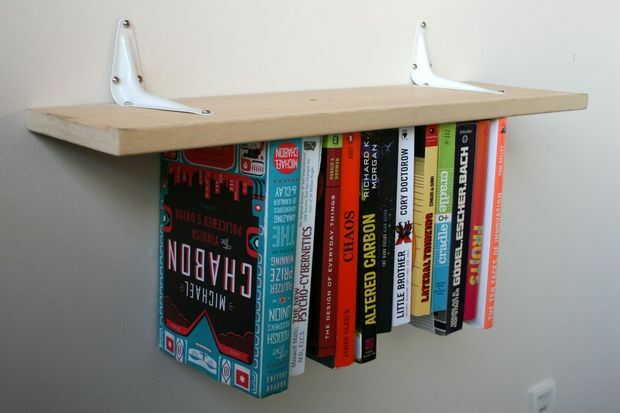 But you can accomplish what looks like the impossible with one secret tip: staple cloth elastic strips to the underside of the shelf, and snuggle the books into them so they have a resting spot. Tip: measure the cloth elastic strips on the books before you cut and staple. A Möbius Strip is something that goes on forever: one end winds into another, and there’s no beginning or end. 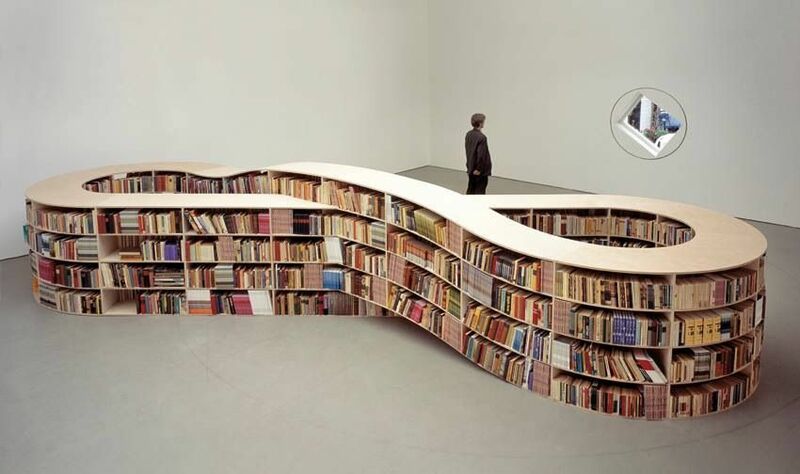 It looks like a sideways figure eight — the symbol for infinity — and now you can make a bookcase out of it, too. You’ll need some carpentry skills to pull this off, but once you’ve got your books lined up on the outside, going round and round forever, you won’t be able to take your eyes off it. 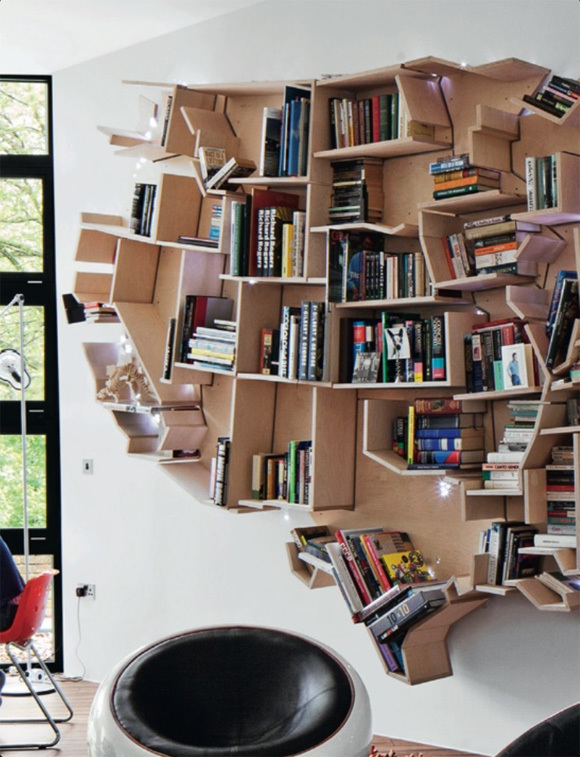 Show off your nationalism in an intellectual way by creating a wall-hanging bookcase that’s in the shape of the United States. All you have to do is trace a map onto a large piece of plywood, cut borders, and then glue or nail them onto the backboard. Not all shelves will be able to hold books because of oddly-shaped border lines, but it’s more of a looker than a book holder. Imagine two small bookcases, each about the size of a nightstand, and about four feet apart. Now picture a curvy bench in the middle that you can stretch out on while reading your books. Pretty cool, no? You’ll want to use the same material for both bench and bookcase, so make the bench part comfortable by putting a chaise lounge-style pad on it. This conversation starter is a bunch of short tubes, stacked on top of each other with a shelf at the bottom to hold books. 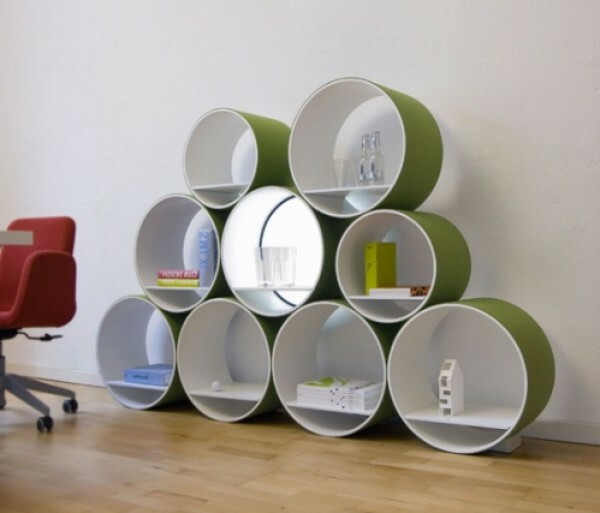 You can roll the tubes to anywhere you want in the room, which makes it super easy to set up and transport. And with chocks holding the base tubes in place, it’s actually pretty sturdy, too. 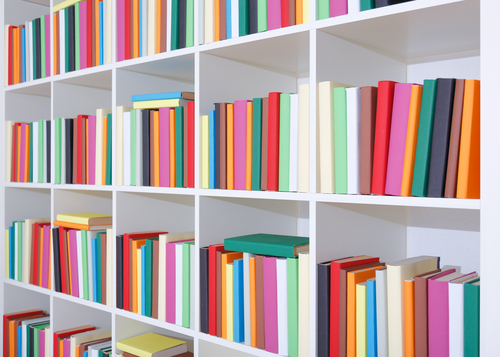 Instead of taking on a huge remodeling project in your home, bite off a smaller piece of the pie by focusing on a really cool bookcase. You don’t have to spend weeks and weeks on it or break the budget, just use these neat designs that’ll fit in almost anywhere.